This morning, unfortunately, a family member was throwing up. I put up a pot of chicken soup to boil, gave the family member little sips of kombucha and grape juice to hydrate, and decided I wanted to also make some jello since hydration is an issue when one is throwing up, and typically jello is easier to keep down than pure water. I could have made homemade apple jello, but I was thinking that a ginger based jello would probably be best, since ginger is a remedy for nausea and can prevent throwing up. 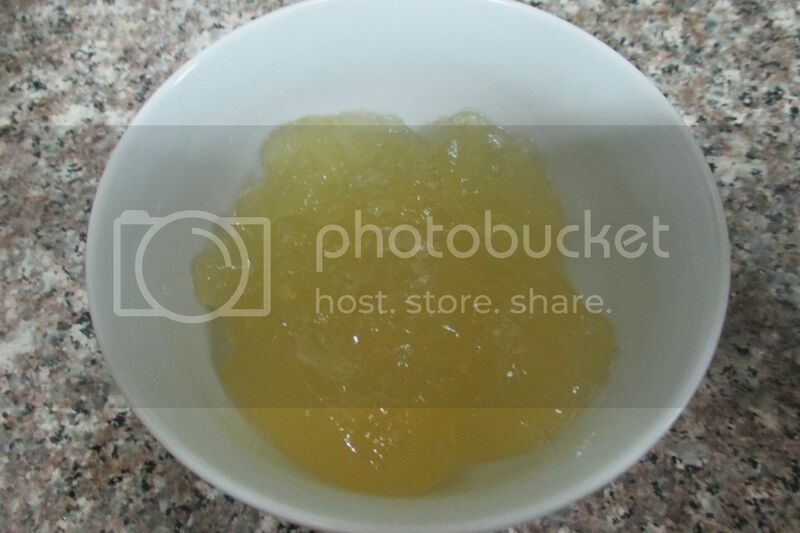 Google gave me a few results for ginger jello, but they were all made from store bought ginger ale, something I didn't have at home, and that anyhow is expensive and difficult to get locally. I decided to make a ginger based drink- also known as gingerade, and turn that into jello. Fortunately, by the time the ginger jello was ready a few hours later, this family member was fully better and no longer had a need for it, so it will be our dessert. It is certainly tasty enough to have as a dessert, doesn't just need to be made if someone isn't feeling well. You can use sugar instead of honey to keep down the cost, though it obviously is less healthy that way. And you can just make this as a chilled drink if you want- gingerade- instead of turning it into jello, if that is what you desire. I used 1.5 oz of ginger root and it was mildly gingery tasting- if you want a stronger ginger taste, use up to 2 oz. This recipe is GAPS legal if made with honey. 1. Put the ginger and boiling water in the food processor or blender until the ginger is chopped up finely. Let it sit for 15 minutes. 2. Strain the liquid out of the ginger through a cheesecloth or mesh strainer. 3. Put 1/2 cup water together with the gelatin powder, and let sit for 30 mins to soften. 3. I read that the enzymes in ginger can stop gelatin from setting, but I'm not sure about that. Boiling this ginger water will destroy the enzymes and ensure that there won't be any issue. I can't promise there is actually an issue, but I boiled the ginger water to just be on the same side. 4. Add the honey and lemon juice and stir until completely dissolved. 5. Add this liquid to the softened gelatin, mix well with a whisk so it all dissolves. Add 3 1/2 cups water to this, and mix well. 6. Refrigerate for a few hours until it is completely solidified. 7. Alternatively, if just making a drink, after step 2, add all the rest of the ingredients other than the gelatin, mix well, and chill. Are you a fan of ginger? Have you ever had gingerade or ginger jello? Does this look like something you'd make or that your family would enjoy?